One of the things that sets Disney apart from any place else is the attention to detail given to everything- especially the mundane things that would normally go unnoticed elsewhere. Case in point: lamp posts. The first in a series of posts on Attention to Detail focuses on these luminous structures. These lighting fixtures are found everywhere, in each park and resort. As with most things, though, Disney does it with flair. 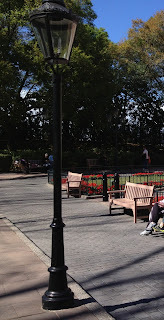 Each lamp post found throughout WDW is themed carefully to its environment. Each one represents the area it lights, enhancing its surroundings or blending seamlessly with the atmosphere. Below are a few examples. Have you ever noticed the light fixtures around the parks and resorts? Tell us about it in the comments. Can you guess where each one can be found? You can leave your guesses in the comments as well. Just a sampling of some of the many lamp posts that illustrate Disney's Attention to Detail. Beautiful pics. I love the gargoyle lamp in the new fantasy land. Can't wait to see it in person! How was the weather? Q: New FL, near Ariel? Yeah! I, too, have a little collection of the awesome lamp posts! It's not as extensive as this one, but good to see someone else recognizes how awesome they are! I absolutely LOVE this! It makes me wish I was headed back to WDW soon, so I could pay better attention to the lampposts! Stopping by from SITS Saturday Sharefest. I don't know where they are from exactly - but some look like Epcot center and maybe the Animal kingdom? I can't wait to visit WDW as an adult! I've been as a child, and I don't remember much from the trip, but in a couple of years, I will be taking my daughters. I can't wait to take it all in! I have actually purchased a lamppost from the company that made them for mainstreet in the Magic Kingdom. It is the same post except that I had mine painted black. It tickles me to death every time I look at it.